Post Codes were introduced in Australia in 1967. What was initially only a tool to improve efficiency of distribution of mail has now become a very versatile “point of reference”, with many different applications. For example, a lot of important information is published “by postcode area” (like real estate sales, social trends, demographic statistics, etc. ), very often franchise or sales territories are defined based on post code extents and now even street gangs started using post codes to define their territories of influence and post code numbers became the symbols of their allegiance! 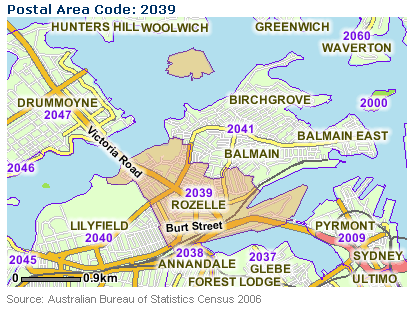 In Australia postal codes are usually assigned to geographical areas (eg. suburb or town) but they are not always contiguous areas and quite often have complex geography, especially in areas beyond the urban fringe, and tend to change over time. Post codes can also relate to individual addresses or to institutions that receive large volumes of mail, such as government agencies and large commercial companies. 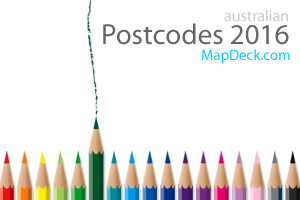 Australia Post maintains the most up-to-date database of post codes with detailed references to localities. Postal boundaries data published by Australian Bureau of Statistics (ABS) are updated at every population Census (the last one was in 2006). 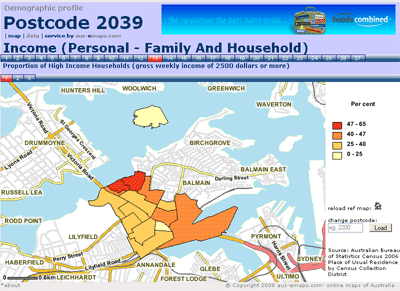 create and print maps of postal areas and suburbs/localities contained within. Please note, due to limitations of Google Map, printing is only possible in Internet Explorer. Click “about” link on Postcode Finder page for important information on printing. Postcode Finder supports text based search via input boxes located in the top left corner of the page. The first one is for searching by post code number and the second is for searching localities. If search was successful, a location will be marked on the map and an information window will display a range of options for adding post code and suburb boundary overlays with respective labels. If you were searching using post code number, “Ref-map” tab will contain an image showing full extent of a given postal area (depicted here on the right). The image can be copied to your electronic documents using "right mouse button click" function. An alternative postcode search option is via a click on the map. It will initiate a search action for a post code that covers that exact geographic location. Please note, water bodies have no assigned post codes however, click on any other area on the map should return a valid response (try again if you are not successful!). Background map in Postcode Finder can be changed between street directory, satellite image (with or without street overlay) or terrain map to suit your requirements. Postcode Finder supports “link to map” functionality which you can use to bookmark locations of interest with a specific background map option. To view boundary outlines just click on the map and select required layer from the options in the "pop-up balloon" that will appear. A distinctive feature of Postcode Finder is a list of links to demographic information from Australian Bureau of Statistics (ABS). “Summary statistics” link will take you to a page with a brief overview of main population statistics for the area. “Thematic maps” will show distribution of population within a postal area according to certain characteristic like income, profession, employment status, etc. (as shown on the map on the right - click it to view live page). “Detailed data” link will take you to a page where you can select and download information as Microsoft Excel files. Functionality of the last two pages is very similar: just click on the first row of numbers to select the topic of interest and on the second to select specific data item. And both pages can be linked to directly from any web site or electronic document (click "about" link under the map for full instructions). 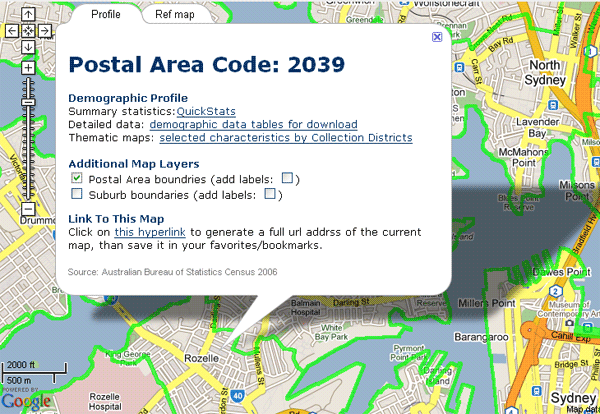 For example, to link to Thematic Maps page use the following URL: http://www.aus-emaps.com/postcode_demographic_profile_map.php?pc=2000 [substitute "2000" with a postcode of interest]. This resource is a very handy research tool. Demographic profiles for postcodes can greatly assist in strategic planning and marketing of consumer goods and services. They are also very handy in real estate when assessing properties for purchase or investment. There are over 90 thematic maps and 248 detailed data tables for each individual post code. All free for your perusal, without the need to sign up to use the service. Hi Tricia, there is only one place for Australian population statistics - Australian Bureau of Statistics. 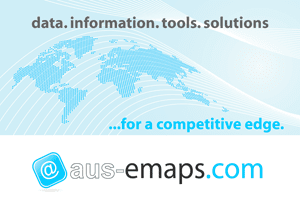 Or if you prefer something in ready to use format, send us an email on info@aus-emaps.com.